Two years ago, when Yahoo reportedly asked Ray Bradbury about making one of his book available online, he had a few choice words. "To hell with you. To hell with you and to hell with the Internet." Not everyone understood his sentiment, especially those who believe e-books will live forever and make censorship of books, like Fahrenheit 451, impossible. But Bradbury never saw it that way. Bradbury believes in books and libraries. Everything else is too easily tampered with, much like he told a well-known publishing house in 1974. The editors wanted to put together an anthology for young readers containing 400 short stories by Twain, Irving, Poe, Maupassant, and Bierce. He declined, knowing all too well that the editors intended to simplify and reimagine the stories. "There is more than one way to burn a book," he wrote in the coda of his 1979 edition of Fahrenheit 451, a cautionary tale about dumbing down hard-fought knowledge as much as it is a warning against censorship. The Internet to Bradbury, for all its potential, is also a distraction. 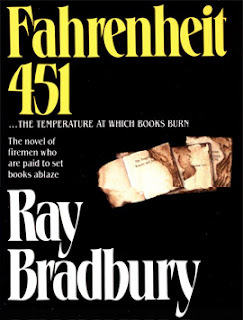 Fahrenheit 451 is the temperature at which books burn. Nonetheless, Bradbury has finally acquiesced. Fahrenheit 451 recently transitioned into the digital world two years before its 60th birthday as a book (but not before the 60th birthday of its shorter debut, The Fireman). Sometimes considered the ultimate in banned books, given it's a book on banning books, there haven't been many years that someone hasn't challenged Fahrenheit 451. The most common reason to ban the book from school libraries is because it contains "hell" and "damn." More colorful reasons include that it supposedly advocates burning the Bible (because a Bible is burned in the story) and (once upon a time) made a direct attack against McCarthyism, which took hold in the late 1940s. Ironically, many of Bradbury's stories contain references to God and faith. And in 1979, he mentioned that one of his stories, The Foghorn, was edited (for the opposite reason that Fahrenheit 451 was challenged) because it supposedly contained pro-God references, including a "God-Light" and being "in the Presence." Bradbury himself seldom talks about his religious or spiritual beliefs, which is why a CNN article last year was such a rarity. The story of Guy Montag, a fireman who burns books in the 24th century. Set in an unnamed American city where people no longer read books, Guy Montag has one of the most respected jobs. He is a fireman, which is considered an admirable profession in a society where people are content with state-approved programming on flatscreen televisions and wireless radio headphones. Montag is content in his world view until a strange set of circumstances shakes his resolve. A young girl, Clarisse McClellin, begins asking him penetrating questions. His wife, Mildred, attempts to commit suicide, sparked by her unfulfilling existence. An old woman, who is caught with a stash of books, elects to burn with them rather than live without them. And to better understand these inconstancies, he begins to browse through a few books that he himself had previously saved from his own fires. He also turns to Captain Beatty and Professor Faber, two complex characters who both try to help Montag and dominate him from their polar opposite viewpoints. Beatty dissuades Montag from caring about books, despite being well read and alluding to his previous love of them. And Faber encourages Montag to think for himself, while convincing Montag to do his bidding. And these two characters are not alone in their paradoxical nature. Bradbury is near clairvoyant at times in a book that doesn't age. Although Bradbury sets two nuclear wars in the 1990s that helped usher in the direction to the dystopia he envisions, other predictions have an uncanny resemblance to a future he has lived to see. Our cars are fast, special interest groups are frequently polarizing, flat screen televisions are as large as walls, and wireless headsets are commonplace. While he typically paints all of these devices with satirical disdain whereas most exist with their own paradoxes, Bradbury actually depicts what would happen if the fragile balance were tipped in one direction. Digital books may have helped renew interest in reading, but some skeptics note that the quality of writing feels diminished at times. 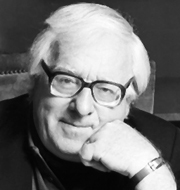 Bradbury himself has always been interested in the fantastical. Had he not discovered writing, he might have become a magician. Some might even argue that Fahrenheit 451 was magically inspired. He wrote it at UCLA's Powell Library where typewriters could be rented for one dime an hour. The original, he says, cost him nine dollars and eighty cents in dimes. It was the price he paid to avoid being distracted by his children when they begged him to play. He always played. 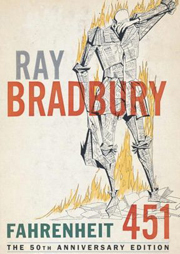 Fahrenheit 451 By Ray Bradbury Burns At 9.6 On The Liquid Hip Richter Scale. Although not as intense as other dystopian novels of its time or the original dystopia, the merit in Fahrenheit 451 is its ability to efficiently explore several complex themes, including the paradoxical nature of people. Similarly, its harshest critics tend to be kids who have to read it in school. They say it's too long or too complex. Fahrenheit 451 by Ray Bradbury is available at Amazon. The paperback edition is less than the electronic version. Fahrenheit 451 is also available at Barnes & Noble or the book can be download for iBooks. Fahrenheit has been made available on audio several times. The audiobook read by Christopher Hurt is the better pick than the one read by Bradbury. As much as his effort to read was appreciated, it's the rare author who can read out loud as well as they write.